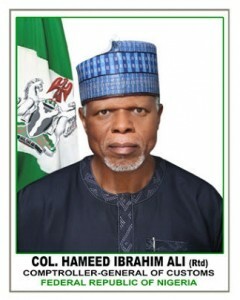 The Comptroller General of Customs, Hameed Ali has approved the redeployment of 69 Comptrollers serving at various commands, headquarters Abuja and zones of the Nigeria Customs Service. A document obtained exclusively listed the affected Comptrollers to include Comptroller Jubrin Zakari formerly in charge of Tin Can Island Port to Excise unit at the Customs headquarters just as Comptroller Willy Egbudin moves from Enforcement, Investigation & Inspection unit at the Customs headquarters to Apapa Area Command, while Victor Dimka who was in charge of the Federal Operations Unit (FOU), Zone C moves to the Enforcement, Investigation & Inspection unit. Comptroller Bashir Yusuf moves from ICT unit to head Tin Can Island Port Command while Usman Kankara Bello moves from Post Clearance Audit at the Customs headquarters to take over the Import & Export unit from Jubrin M who has been redeployed to FOU Zone A, Lagos. Similarly, Comptroller IsahTalatu was redeployed from PTML Command to Customs Staff College, Gwagwalada while Olubiyi R.O formerly in charge of Lilypond command takes over as Controller of PTML Command. Comptroller MaduguSanni moves from Customs Training College, Ikeja to Sokoto/Kebbi/Zamfara Command; Allanah F.A moves from Tariff and Trade, Customs headquarters to Murtala Muhammed International Airport Command; while Haruna Mamuduwas redeployed from Ogun State Command to FOU Zone C, Owerri. Maikarfi Y.I moves from World Customs Organisation unit at Customs Headquarters to Seme Area Command. Others are Tajudeen Olanrewaju who has been redeployed as Controller of Port Harcourt Area 1 Command from Customs headquarters; Dalhatu M.A moves from Human Resource Department to Lilypond Command and Multafa W.J from FOU Zone D, Bauchi now heads the Ogun State Command. Ogunkua T.B has been redeployed to head Oyo/Osun Command while Adetoye O.F moves from Zone A, Lagos to serve on the Customs Board in Abuja. Comptrollers Umar Yusuf and Enwereuzor Frances in charge of Western Marine and KLT commands respectively both retained their previous postings.